I will use the same technique as was done in the NLSY97, namely, Jensen’s method of correlated vectors. I found a total of 55 mulattoes, and 156 multiracials. The ‘mulatto’ variable specified blacks with white (i.e., european) ancestry, while the ‘multiracial’ variable specified blacks with non-black ancestry, that is to say, blacks with some mexican ancestry, or asian ancestry, or indian (american) ancestry, or white ancestry, and so forth. 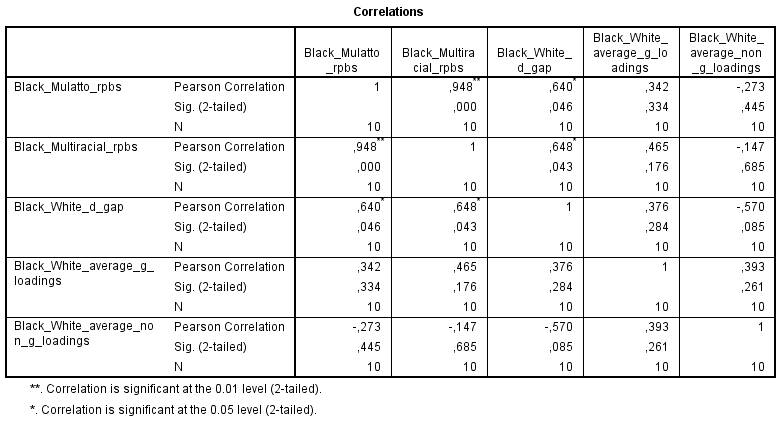 As can be seen, the corrected rpbs for Mulatto variable seems a little bit higher than rpbs for Multiracial variable. 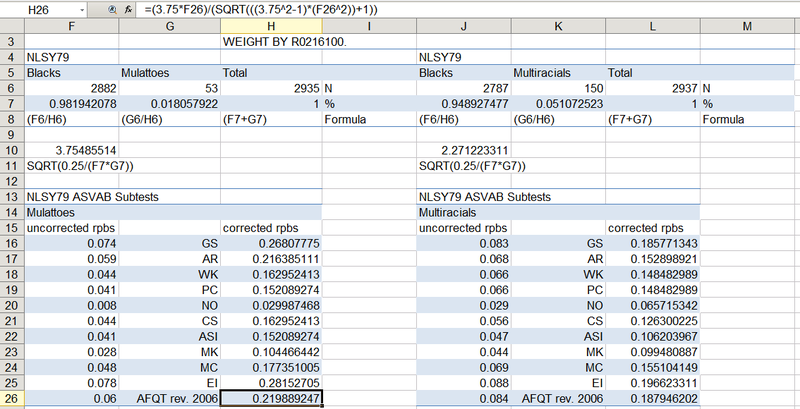 For AFQT (2006 revised) the corrected rpb is around 0.22 (by way of comparison, the ASVAB 1999 BB-BW gap shows a corrected rpb of 0.28, and uncorrected rpb of 0.19). In any case, using either corrected or uncorrected rpbs, we can estimate the correlation between the magnitude of BB-BW difference and the magnitude of black-white d gap, B-W g loadings, B-W non-g loadings, as shown below. For obtaining these correlations, I use the estimates of B-W g-loadings and non-g-loadings, as well as B-W d gap reported in my earlier post on IQ regression to the mean (Hu, April.18.2013). Given this, the Jensen effect is apparent, and to this can be added another Jensen effect test by Chuck (May.9.2013) in another article on the Scarr et al. (1977) admixture data among US blacks.